Jeremy Corbyn has defended himself against accusations that he is too old to serve as prime minister and dismissed suggestions of a turf war following the ousting of a longstanding Labour official from a key disciplinary committee. Corbyn hit back after anonymous frontbench briefings that he would stand down as party leader before an election, due in 2022, appeared in three newspapers and blogs this week. The veteran socialist is 68 and, if he makes it to Downing Street would be 78 by the end of a scheduled first term. He also shrugged off suggestions of factionalism after Ann Black, the chair of the national executive’s disputes committee, was removed from her post and replaced by Christine Shawcroft, a Momentum official. It was the first meeting of the panel after the left swept the board in elections for three new NEC places. It is Corbyn’s comments on his age, however, that may capture public attention. 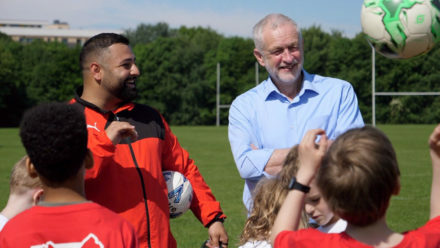 The Islington North MP, who rarely drinks and breakfasts on porridge, told The Guardian he goes running each week as well as cycling four or five kilometres. “I am the age I am. It is not a secret – and I consider myself perfectly fit and able to do what I do. I’m actually younger than other leaders,” he said, in a reference to Donald Trump, 71, the details of whose medical check-up were released this week. Corbyn also gave his first full response to the huge win for the Labour left in the NEC elections. Several Labour MPs this week criticised as highly factional the decision to remove Black – who was part of the left slate until a falling out over the rules for the 2016 leadership election – from the committee which deals with allegations of racism and anti-Semitism. “I wasn’t at the meeting [but] there was an election and a new chair of the disputes committee was elected. The outgoing chair remained in the meeting,” Corbyn said.